Wish you all Happy Ugadi!!! 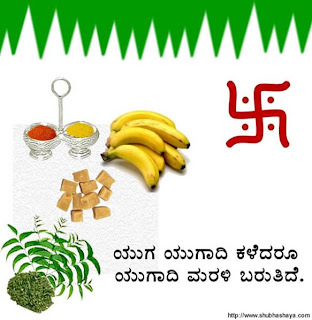 Ugadi is a New year celebrated in Andhra Pradesh and Karnataka by Telugu and Kannadigas. This is also called Chandramana Ugadi. Chaitra masa starts on this day. Bevu Bella which is mixture of neem leaves and jaggery is served in Karnataka. Ugadi Pachadi is prepared in Andhra Pradesh. Sweet and bitter represents joys and sorrows of life. People take oil bath, wear new dress and offer special prayers. Gudi Padwa is also new year celebrated in Maharashtra, India on the same day . Many delicious food is cooked and celebrated with family and friends. Parap Boli(Bele Obattu in Kannada) - Prepared with stuffing of dal and jaggery in dough.